When the scoop falls off the cone. While finishing up a purchase at the grocery store with the family, my daughter Coco (10) asked me if she could run next door and buy a scoop of ice cream. I said sure…… so my wife Amy and Coco headed out toward the ice cream shop. Amy handed Coco a $5 bill and walked over to our car, which was right in front of the ice cream store. At few minutes later, I was coming out of the super market with the groceries and Coco was jumping in the back seat of the car. I walked up, put the groceries in and off we went to take Coco to dance class. Later that afternoon, Amy went to pick her up at dance and Coco mentioned that she actually didn’t eat ice cream. It seems that Amy and I were too busy talking in the car earlier to notice that Coco wasn’t eating a cone. Here’s what happened. Coco bought the cone, walked outside, took a lick and the scoop dropped on the ground. She went back in to explain what had happened, and the employee told Coco she would have to buy another scoop (more than $3). So Coco, being the good kid that she is, decided to accept her fate and move on. The story could have ended there…..but of course, it didn’t. My wife Amy isn’t one to complain, but if she feels wronged, you’re going to know about it.So, Amy went back to the ice cream store and explained to the employee that our family has been in the ice cream business for more than 20 years, and charging someone again for a dropped scoop is just plain wrong. The employee went on to say that this was the owners policy. She said that it happens all the time. Two other employees were “snickering” in the background as if Amy was an evil, hard to please customer.A few things wrong with this picture:If you’re so desperate to lose the 50 cents the scoop costs you to replace it, you’re in big trouble and should either sell the business or accept that you will soon be closing it.If it happens all the time, meaning scoops fall off the cone all the time, then the “scoopers” are doing something wrong. There’s an art to putting ice cream on a cone. 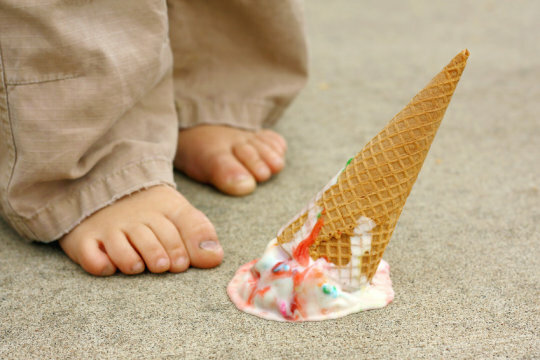 Sure, once in a while someone is going to lick the scoop off the cone, and it will fall to the ground. But if this is happening regularly, then it is not the customer’s problem, it is the store’s problem. At the very least, the server should warn the customer if the scoop is not secured to the cone the way it should be.Our family is a “great customer” who is capable of spending at least $100 a month at an ice cream or yogurt shop that we like. We will never patronize that store again.Is it worth losing a potential regular client for 50 cents? The answer is clearly NO in my opinion.It’s difficult and expensive to get new customers in the door. Make sure that the experience is outstanding and your business will grow and grow.Worry about losing 50 cents on a replacement cone and watch yourself start cutting back hours, laying off employees and see your business slowly deteriorate.The owner of this shop is obviously struggling and he or she probably thinks that it is due to the economy, or because of some other reason other than the stores customer service.I’m sure if I went to that store again, at some point, they would serve me re-frozen ice cream.I say this because it’s a slippery slope when you try too hard to control costs and do so in areas where it has no place (product quality and customer service).I understand the need to control food costs and keep them low. It’s tough to throw away product. But the minute you start selling ice cream that “just melted a little” is the day you need to be in another business. If you have to raise prices, raise prices. 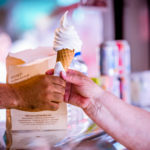 Trust me on this one – you will lose a lot more customers by selling them sub standard product than by charging them more for a quality ice cream. If you’ve had a bad experience in an ice cream shop, please feel free to comment below and share your experience. Or, tell us about a great experience you had in an ice cream shop and why you will continue to go to that store. 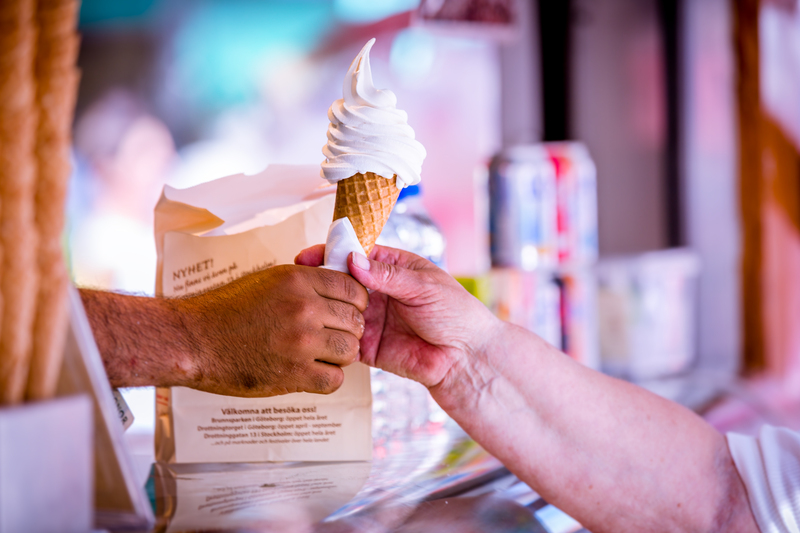 If you own an ice cream parlor, frozen yogurt, gelato or Italian ice store, tell us how you make sure your customers have a positive experience (comment below). What’s the better option, making your own ice cream or buying and reselling 3 gallon tubs of a recognized brand? Truthfully, there is no right answer. Both could be great options. This post will simply to outline reasons why you would go in one direction vs. the other depending on your specific situation and your specific goals. This question is frequently debated and asked by almost everyone planning to enter the ice cream store business. In my opinion, it depends on many factors. I encourage those of you who make your own or buy a national brand in 3 gallon cans to post what led you to your specific strategy. Initial investment is lower – you only have to buy dipping cabinets and storage cabinets vs. a batch freezer, hardening cabinet, dipping cabinets, etc. 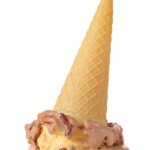 Interested in attending a FREE, live webcast on how to make ice cream, gelato and italian ice? Click the link below to read more and to sign up if you’re up for it. Don’t forget to come back here and post your comments! The year was 1988. I was in Florida at the time, working for Multi-Vest Options in Ft. Lauderdale, shortly after graduating from Florida State. A little history…. We grew up in Puerto Rico. Our father moved there from Chicago in the sixties and started a successful direct marketing business. John did a few years in different stateside colleges but did not graduate. Instead, he took flying lessons and got his pilot’s license. He started a distribution business where he would fly fresh produce from Puerto Rico to the US Virgin Islands, The British Virgin Islands and further down the Lesser Antilles. My brother was obsessed with perfection and delivering the perfect product. I remember helping him one summer while I was still in college. We were sorting through cases of apples preparing to fly them to St. Lucia. John made me go through each and every apple in each and every case and remove the bad ones and replace them with good ones. I asked him why he was so worried about an apple having a bruise, especially if it was in the middle of the case. Who would know? He said that the best way to grow your business is to deliver a better than expected product and delight your customer each and every time. “Over deliver Neil, and they will keep calling you back”. All I could think of at the time was, my back hurts….when do we pack up and hit the beach? Needless to say, word got around fast and more and more customers wanted to buy product from that guy that flies in from Puerto Rico. The business flourished. But John only had one plane, and he could only carry so much produce. He started looking for a higher profit product. No, not “that”– although drugs were exactly what was going through each and every customs agent John had to face. They found it hard to believe that John was actually trying to build a business around flying produce. As crazy as it seems, he was doing exactly that. Enter ice cream, a much more profitable product than produce. John noticed that the ice cream on the supermarket shelves and ice cream parlors in these islands was almost always re-frozen. Horrible quality, at a high price. People accepted it and figured that this was the way ice cream was. Icy, grainy, sandy. He saw an opportunity and ran with it. He developed a system of double corrugated cardboard boxes lined with polystyrene (like the inside of your basic foam cooler). While inside the walk in freezer of the ice cream distributor in Puerto Rico, John packed and sealed the boxes to ensure that the tubs and pints remained rock solid. The flight was about an hour long, and John could get about 5 hours out of these boxes before the ice cream began to suffer. The 5 hours would give just enough time to get to the last account and deliver perfect product. Once done in the walk in freezer, he would pack the boxes in his van, head for the airport and take off for that day’s island. Upon landing, he would quickly rent a pick up truck, clear customs, load up the boxes and head out to sell his accounts, who had pre-ordered the product. I’m not making this up…..although it seems hard to believe that anyone would try to build a business around this concept. Once John tired of the constant every day rush to avoid “meltdown” he realized that he needed to buy a truck. That is when I got the call and moved to St. Thomas, the island with the most promise. John continued to fly the product in, but we decided to concentrate on building the business on St. Thomas. 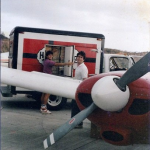 The picture at the start of this post is of the two of us, John by the plane and me loading Haagen-Dazs bars into the truck. John would fly back to PR, and I would calmly go out and make deliveries. About a year later, my brother Michael joined the business. We bought another truck and Michael moved to St. Croix, to develop that market. I remember how John would always set goals and break-even points around the number of boxes we could sell in a given week. He would say things like, “when we get to 90 boxes a week, we’ll be making some decent money…..so we need to open some more accounts to get there”. All I can remember was thinking, boxes? Boxes? We need to start thinking in dollars and another way to grow this business. It didn’t take long for John to start thinking in the same terms. At this point, we were starting to move enough product to start buying it in Florida and shipping frozen containers down to the islands. We built walk in freezers on both St. Thomas and St. Croix. Our suppliers (Haagen-Dazs and Dreyer’s/Edy’s) were very happy with our performance and John was given the rights to distribute the Dreyer’s/Edy’s line for “the big island” – Puerto Rico. He later added Ben & Jerry’s to the mix. 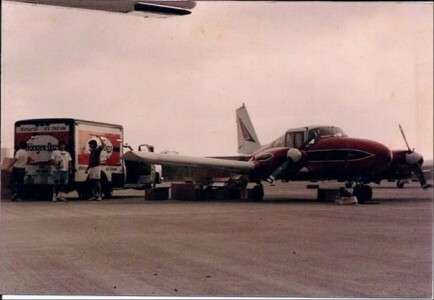 By 1998, we had built a business with over 15 route trucks in Puerto Rico, St. Thomas and St. Croix. John and Michael are still actively managing the business today. 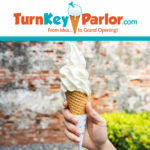 In 2001, I started to get “island fever” and decided to move my family (wife Amy and two girls, Chelsea and Coco) to North Carolina where I began to develop TurnKeyParlor.com. I still talk with my brothers on a regular basis and frequently bore others with our constant ice cream business conversations. So, the moral is….I’m really not sure……. No, all kidding aside, the moral is….. work hard, “over deliver” on your promises and good things will come your way. The goal at TurnkeyParlor.com is to offer the “best apples” possible to my customers on a daily basis. So far, this approach has helped me build a really solid, rapidly growing business. TurnKeyParlor.com is visited by thousands of prospects a month, many who turn into long term customers. If you have a story you would like to tell, or would like to comment on my story, please do so. Thanks for reading this post. 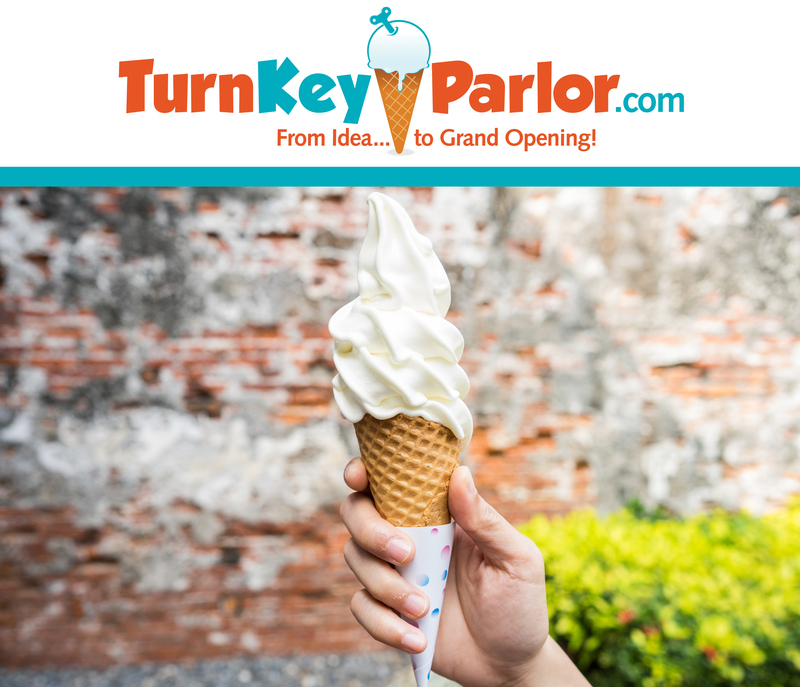 This article was written to provide a few basics on opening an ice cream parlor. There’s a lot more to it that is listed here, but reading this might give you a little bit of an idea of what is required. If you own an ice cream store, and would like to comment, please do. We encourage you to challenge our assumptions and contribute to our knowledge base. The most important decision you will make on the road to success is most likely to be the location you choose. You’ve probably already heard of the 3 most important factors involved in a successful retail operation: location, location, location. I cannot stress enough the importance of this, especially when it comes to ice cream. Ice cream is an “impulse” product. In other words, people who buy ice cream usually do it on impulse when they see it and are tempted. It is less likely these days that people will make a conscious thought to go to an ice cream parlor. Sure, some still do, but more sales are made to customers who happen to be brought to the area for another reason. Car traffic is nice, but more importantly, how many people are walking by? Are they typically there to browse or to buy? Being in a Wal-mart type plaza doesn’t guarantee success. It depends on how close to the Wal-Mart door you are. Talk to existing businesses and ask them what the traffic is like. If you are counting on car traffic as your main traffic, a drive thru window is almost mandatory. Enclosed malls are better for year round traffic and people prefer them to stroll through and buy ice cream! In general, it’s better to pay more rent and be in an enclosed mall than to pay less and be in a strip mall. 3-4 good anchor stores would help. Visit the site on different days at different times to see how consistent the traffic is. Competition: How many parlors within a 1 mile radius? If inside a mall, who else is serving ice cream? Competition is not necessarily a bad thing. If someone else is on one side of the mall and doing well, chances are that you will do well on the extreme other side of the mall. Population is key. If the area is somewhat congested, that’s a good sign. Visibility. Will everyone who walks close by know that there is ice cream there? Would you buy ice cream there? Hours of operation: Make sure that the peak traffic flow is during hours that you’re willing and able to be open. Make sure you have adequate space. 800-1000 sq ft is a pretty good middle ground. Indoor Malls, airports, zoo’s, university campus, amusement parks, strip malls (high traffic), next to a movie theatre, superstore (inside a Wal-mart), professional building, train station, beach area, sporting arena. Strip Mall unless in thriving area with obvious high traffic (low traffic, no real anchor’s), busy street (but being on the wrong side), gas station, defunct fast food/snack operation. After you find out what they want for monthly rent, don’t be afraid to ask for a stepped up lease with a low initial amount. For example, free rent for the first month, half the rent for the next three months, then full rent beginning in month four. Or a couple of hundred off per month for the first year. This is just a negotiating guideline. They may not go for it, but it doesn’t hurt to ask. In fact, they may be expecting you to. If you don’t, they may feel they can take advantage of you in some way. So it’s always best to shoot for the sky and then see what they will give in to. It is in their best interest to help you get off on the right foot and be successful. Many will be willing to help if they believe in you. I am not qualified to give legal or tax advice, so I really cannot guide you here. I can tell you that incorporate.com is a great website that can explain in pretty basic terms what would be best for you as an individual or group of people and do it pretty cheap and painlessly. 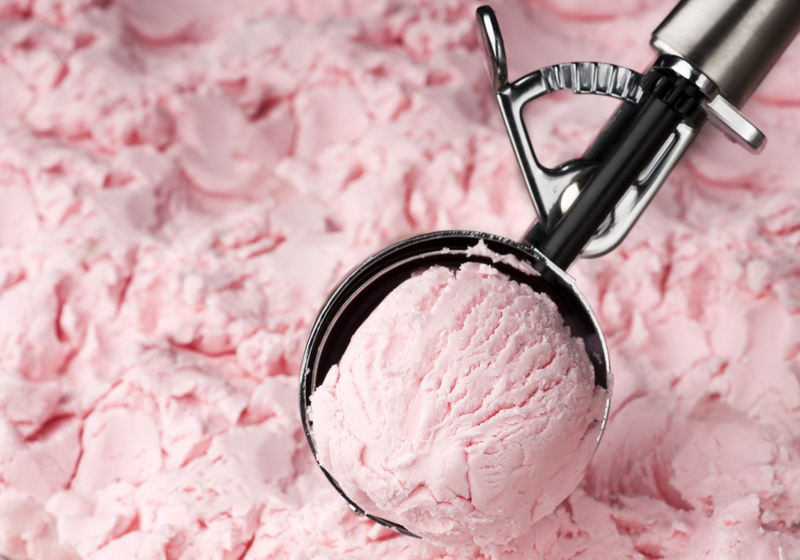 In general, parlor ice cream is packed in 3-gallon tubs. Edy’s, Breyer’s, Blue Bell and most premium brands come in 3 gallon, round cans. A ballpark figure as far as cost is concerned is about $26/tub for premium ice cream. Some companies charge less for Vanilla, Chocolate and Strawberry and a little more for everything else. The $26 is a good average figure for premium ice cream. You are supposed to get 55 four-ounce scoops out of a 3-gallon tub. This works out to .47 cents per scoop. I like to add 8 cents to the cost to cover waste, giveaways, etc. So were looking at .55 cents per scoop. Many companies will try to manipulate these figures in their best interests, but I can tell you from experience that the $.55 per 4 oz scoop is pretty reliable. Add another 5 cents for cup and spoon or the cone for a total of .60 cents per scoop. Very doubtful that in real life it works out to be any less, even if you are paying a few bucks less for the tub. Cheaper tubs usually have more air whipped in and you yield less, therefore having the same or higher cost when it comes down to it. My recommended retail is $2.00. It is not a bad idea to try and diversify your operation as much as possible. Popcorn, cotton candy, and other fun foods are a good incremental sale. Cookies and pastries are also good if you know a good place to get them fresh. A suggestion may be Otis Spunkmeyer, a vendor of cookies, brownies, pies, muffins, etc.). 888-ASK-OTIS. It would be great to be able to have both soft serve and hard pack in your parlor. Depending on your financial situation, this may not be a reality. Soft Serve machines are relatively expensive. They are a good investment if you are adding them to an existing snack shop and want to get into the ice cream business, but I don’t necessarily recommend them to start off with if you are on a limited investment budget and trying to get a parlor off and running. You can purchase 2 sixteen-flavor dip freezers for less than what a 2 flavor soft serve machine will cost you. Hard pack yogurt can be excellent! On the other hand, if you have the financial backing, there are many soft serve fans out there, and this can be an incremental sale. There are great premium brands out there such as Edy’s, Breyer’s, Blue Bell, Blue Bunny, as well as many strong regional brands. A key issue when choosing a brand is not only the quality of the product, but also the distribution services in your area. Not all brands are available in all states. You need to find out who distributes the brand (company owned routes vs. independent distributors) in your area and make sure that the organization seems capable and competent to handle your needs. Do they stock as many flavors as you want to carry? Can they give you a flavor list to order with? Who else do they service in your area (you can check with them to see if they give good service and are dependable). What brands to they distribute? If you feel you have the passion and ability that it takes to make your own ice cream I would not argue against it. If this is something you are thinking about, make sure you read the sample business plan closely. The bottom line is: you need to be extremely devoted (full time) to your parlor for this to work. If you are devoted, and passionate about the product you are making, you have a great chance of succeeding. The investment for a parlor that makes their own requires a substantially higher investment. It can be done for less, and certainly for more, but an average independently owned basic parlor would cost you in the vicinity of 50K to put together. Depending on the theme you choose, (“old fashioned parlor with steel stools, etc.) how much work needs to be done to the location, etc., you could be looking at 6 figures.The figures below are intended to give you an idea of how the initial start up costs might breakdown. Depending on your specific theme or situation these figures could be adjusted up or down. Working capital (basically what you should have in your checking account to maintain positive cash flow, etc.) can be as low as $3500. I’ve seen some franchise numbers that suggest a 10k working capital figure. Obviously, the higher the better and the main objective here is to guard against a slow start, unexpected costs, a need for increased advertising and promotions, etc. Most thermostats are the “dial” type. Some have numbers, some simply have a screw that you turn clockwise or counterclockwise. Some freezers have digital thermostats, which are ideal. The thermostat is most commonly found by removing (unscrewing) the grill (vent). Regardless of what type of thermostat dial you’re dealing with, you need to understand that you should only adjust the dial one number at a time, up or down. When you re-adjust the dial, you have to be patient and wait 2 days to see where the average temperature settles. Only at this time can you determine if it needs another adjustment. If it does, you repeat this step. Again, you only adjust the dial one number at a time and wait two days to see where it settles. You repeat this process until you find the sweet spot. You need to be patient because the freezer compressor turns on and off intermittently while working its way toward the dial setting. Other factors that come into play when finding your optimal dipping temperature include the flavors that you are scooping. Yes, some flavors are “softer” than others. 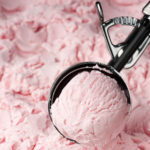 For example, flavors like Rum Raisin or anything caramel based can be soft while some of the other flavors are at perfect scooping temperature. Chocolate is famous for being rock solid and virtually “unscoopable” when other flavors are at a good scooping temp. How do you deal with this? The best way is to make sure that the flavors like chocolate stay out of the corners of the cabinet. Put the hard flavors in the middle of the freezer. 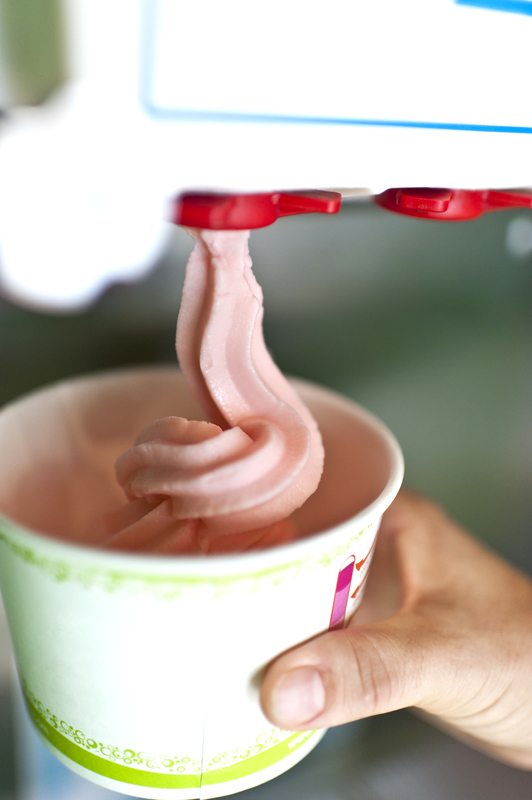 Put your softest flavors in the corners. The reason you put soft flavors in the corners is because in this spot they are up against two freezer walls. The corners are the coldest area in the freezer. In the middle, the tub is only up against one wall and therefore the middle is a little warmer than the corner. I know many of you already know this, but I’m hoping that some of you will benefit from the information. 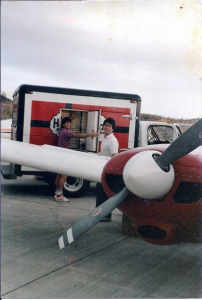 If you read my blog post titled My Humble Beginnings in Paradise, you already know that I spent 10 years in the Virgin Islands building an ice cream distributorship with my older brother John and my younger brother Michael. Every year, as hurricane season approaches, I’m reminded of how Michael and I went through two of them that completely decimated our business. Hugo in 1989 and Marilyn in 1995. At the end of this post, there is a video with some pretty intense footage from both hurricanes. Hugo hit the Virgin Islands with such force (category 5), that our house was without electricity for 4 months. Yup, 4 long months of filling our little generator with gas when we got home from sweating our @%* off at work. The generator would run out of gas at about 3am, the fans would shut off, the temperature would go from 78 to 90 and the mosquitoes would start biting. Ahh, life in paradise. We lost everything, except our ice cream truck and my pick up truck. As you’ll see in the video below, I had an old GMC Sierra, and it was crushed by a huge tree that came to rest on top of it. We weren’t able to leave our house for 4 days after the hurricane because the roads were all blocked by debris. Incredibly, after we cut the tree off the truck, it sprang up and ran (another thing you’ll see in the video)! Once we did, we headed to our “warehouse”, which wasn’t really a warehouse, but a big, old Flavorich side loader truck that warehoused our inventory. When we got there, it smelled like rotten ice cream and it was really, really disgusting. Sticky, melted ice cream dripping out of the door seals. Unfortunately, we couldn’t afford to have someone else clean it, so I had to jump in the maggot infested compartments and power spray it clean. Another little “visual” that has managed to stick with me to this day. John, who was living in Puerto Rico at the time, flew his airplane to St. Thomas and rescued us. We spent a few days in PR getting fed and cleaned up before we headed back to rebuild. John told us he had to freeze our salaries. We had no insurance and took a big hit with our inventory loss. We had to go on an “expense only” allowance where we were reimbursed when we presented receipts. Which basically meant we got to eat food and pay the rent. That was it. This lasted for 3 months while we built the business back up. We slept very little given the conditions, and it took a while for the island stores to get back up to speed. Those were tough days. We really wanted to quit…but hung in there. In 1995, our business was going great. We had built a walk-in freezer in St. Thomas, and had expanded to St. Croix, St. John and the big island of Puerto Rico. Our sales had increased 5 fold. Then the “little” hurricane called Marilyn decided to pay us a visit. By the time Marilyn hit in 1995, I was married to Amy and had a 5 year old baby girl named Chelsea. We lived on Mt. Top, which was about as high up on St. Thomas as you could get. Not a good place to be during a hurricane. We had taken in Amy’s dad, “the Bear” who had a brain injury and incapable of taking care of himself. We also took in Thad, who was an 18 year old kid who needed help. He worked for us on the delivery truck. During the same week, Amy’s brother Josh was paying a visit. We had a full house of 6 plus the cats and dogs. Marylin was supposed to be a minor hurricane. But it turned out to be a monster. Much worse than Hugo, even though it was a category 3. Which was a joke, because I went through both of them, and Marilyn hit us squarely and brutally. We had been through many small hurricanes, so we were all excited in that weird way you get when you know a storm is approaching. Although I must say, having been through 2 major ones, I no longer get excited about any storm. We fell asleep around midnight, only to be awakened by vicious winds. Things started slamming up against the house making really loud noises. Josh grabbed a flashlight since it was pitch black inside the house, pointed it at the ceiling and I asked “is that sky”? Josh said “yes, that’s sky”!! Realizing that the roof was ripping off (our landlord said it was supposed to withstand category 5 winds…ha) we rushed to the bathroom, which seemed to be the safest room. All 6 of us in a bathroom that was tiny – 6 feet by 3 feet at most. For 5 grueling hours, we wondered if we were going to survive. We were barely able to save our inventory. Having gone through Hugo, we were smart enough to buy an old, used generator on the cheap. It worked, but was leaking water and had to be refilled hourly. This was brutal…..pouring water in the radiator, diesel in the tank in 90 degree plus weather. We did have a freezer though, and it managed to hold, which was a plus in our life. No need to clean melted ice cream this time. I guess I wrote this post to let you know that even when things get really tough, they are temporary. You keep plowing through and good things will turn around. Today, the distribution business we built sells a combined $15 million a year with 20 routes. Watch the video below to see some pretty cool footage. The Dreaded Health Department – Why do they make life so difficult? Every day I speak to folks trying to break into the Ice Cream or Italian Ice outdoor vending business. And every day I hear the frustration they experience when trying to get permits to street vend. I’m talking entrepreneurs who are just trying to make an honest buck and do it legally. They are treated like they plan on spreading the plague. I understand the need to keep our public safe…..and yes, the health department plays an important role. But you would think the health department would be a little more business friendly. If I was to list every variation and interpretation of the rules, I’d probably be writing for years. Even within the same county, one person will tell you one thing and the other will tell you another. But if you are trying to break into this business, don’t lose faith. Be persistent and you will find a way. Vending Italian ice seems to be one of the more popular businesses to get into. The cost of entry can be relatively low, so it makes sense that a lot of people see it as a way to make some decent cash without taking major financial risks. The lowest cost way to break into vending Italian ice outdoors is to buy a basic push cart with or without refrigeration. It’s much easier to get a permit to sell Italian water ice simply because it is water based as opposed to containing dairy. Some health departments will allow vendors to peddle Italian ice without refrigeration or any type of sink system. They simply tell the vendor to use a separate scooper for each flavor, and not to cross contaminate the flavors. Seems simple enough. But most health departments will tell people that they need to have a hand washing station. When you only have a few thousand dollars to invest, and most of that is going toward your cart, it’s tough to hear that you need a hand washing sink with running hot water. We sell these outdoor sink systems at TurnKeyParlor.com, but they are very high quality stainless steel mobile sinks and run about $2000. So what are the options if the health department is telling you that the only way you will get a vending permit is if you have a sink with hot water….and you don’t have an extra $2k to invest? Here’s the good news: one of our more industrious customers (Chico Pagan of Kiki’s Italian Ice to be specific) has found an inexpensive way to try and meet this requirement. 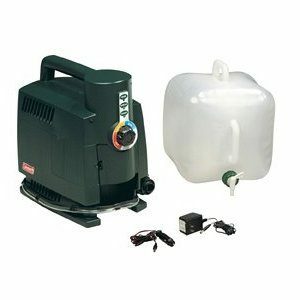 You can go to Amazon.com (see the link below) and get a Coleman hot water on demand unit. This, along with a little ingenuity and a 5 gallon “catch” bucket may meet the requirement. Essentially, you put the fresh water tank on top of a table, connect it to the Coleman propane unit and there you have it. Fresh hot water, complete with the spigot and waste water bucket. All for well under $300. I hope this helps those who have limited funds and are trying to break into the business. If you came across an idea that helped you meet health department requirements, or anything in general that helped your vending business, please share your story by posting a comment. If you have any other questions, feel free to email us at equipment@turnkeyparlor.com! How to make ice cream cakes? Cold Molds! What’s the best way to make your own ice cream cakes? I get this question all the time. And I was never really sure how to go about answering it……. until now. Thanks to a company founded by Russ L’Hommedieu and now operated by ice cream entrepreneur Steve Reppucci, the answer is easy. Cold Molds! Cold Molds are revolutionary tools that make it easy to produce professional quality ice cream cakes, ice cream pops, ice cream tartufos, and more. 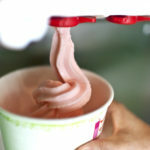 They are specially designed for use with ice cream, sorbet, juice fillings, or any other frozen filling. I highly recommend you check this stuff out. Ice Cream Cakes can make up a huge, profitable part of your business. With Cold Molds help, you’ll be able to make high quality cakes and other novelties. One of the major benefits to producing cakes and novelties in your store is that you will be able to keep your employees busy during your slow times. Let me know what you think. If you have a special way to make ice cream cakes that has worked well, and you would like to share it, please go ahead and post a comment.